My Reflection: The bare necessities of life! I have spent many times to watch and learn about some Disney movies. For a guy who is 20-years-old, it probably sounds weird. But it's fun! They are just movies for kind, but you can find many great values and lessons if you look deeper and see it from different perspective! So, I think I just want to share some! Well, this time I want to talk about a big bear from the Jungle Book movie, Baloo. Some people call him 'papa bear'. This bear has very great thoughts. He's the most relaxed character I have ever known in any Disney film. One theory made by him is called 'The Bare Necessities'. I know some of you have known about it. The Bare Necessities. That's what people need. Baloo's mindset is very simple: "Look for the bare necessities, the simple bare necessities. Forget about your worries and your strife." That's what he does. Just look for things that are really necessary, and don't worry about other things that are not really worth it. Because not everything in life matters, actually. 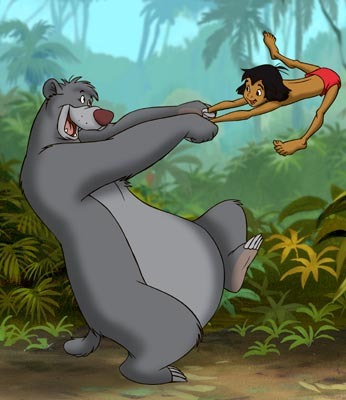 Some people may say: "The bare necessities will make you a person who doesn't have ambition and motivation to achieve better things in life. It can't help you grow to be a better person." "Most people want to achieve something to make their life better. The truth is, when they can't achieve it, they worry and get stressed. It brings pressures in their life, which steal their happiness in the end. So, what's the point?" Yes, maybe that's true. I also agree. But what I see now, most people want to achieve something to make their life better. The truth is, when they can't achieve it, they're worried and stressed. It brings pressures in their life, which steal their happiness in the end. So, what's the point? Great lines from Baloo that gives me new perception: "Don't spend your time lookin' around for something you want that can't be found. When you find out you can live without it, and go along not thinkin' about it." Doesn't it make sense? I think it's super awesome thought. That's what I mean. It's good to achieve something, but keep being realistic. When you can't achieve it, or get some obstacles, you can keep trying. But one most important thing, don't lose your happiness because of it. Because real important things that you really need are actually very few. "Now when you pick a pawpaw or a prickly pear, and you prick a raw paw, next time beware." That's what Baloo teaches. Simple? When you get something bad because of your mistakes ("you prick a raw paw"), don't be sad and blame yourself. Just learn, so you don't repeat it again ("next time beware"). When you realize you can live without something, but it can make you better, all you have to do is trying to get it. If you still can't have it, keep trying and trying, don't give up. It's okay, but don't be stressed and worried because of that. If it makes you so, it's better to let go, since you can still live without it, right? If you still can't have it, keep trying and trying, don't give up. But don't be stressed and worried. If it makes you so, it's better to let it go, since you can still live without it. In conclusion, Baloo doesn't achieve anything in his life, but he never loses his happiness. And I guess happiness is much more important than achievement. I don't say we should not achieve anything, but prioritizing the more important thing first is right. With the bare necessities of life, Baloo doesn't have much, but he always knows how to enjoy what he really needs. Because he knows, what he really needs is much more important that what he wants.